It’s spring! And the first day of spring (on 20th of March this year) was a record-breaking beautiful day, with temperatures of over 21 degrees Celsius. That was great, despite the fact that we didn’t have much of a winter this year. Unlike the US, all of Europe experienced an incredibly mild winter. We didn’t even see one snow flake where I live and work. Only the north of the Netherlands had a handful of days with just a little bit of snow. But still, after grey skies for months, it is great when the sun returns! There’s nothing quite like the light of spring, when the sun is already bright and still unfiltered because the trees have no leaves yet. 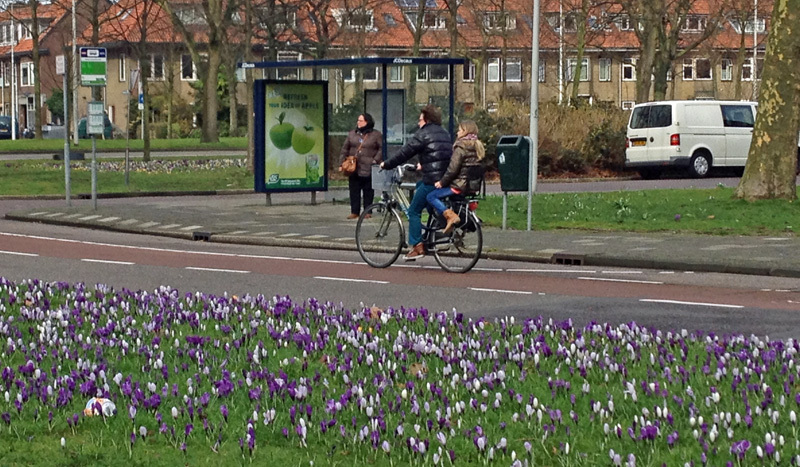 Some weeks ago the crocuses were already in full bloom. So I looked around town for a couple of hours – during my lunch break and after work – and saw many people who were cycling and enjoying the sunshine in Utrecht. They cycled with a back drop of blooming flowers such as crocuses, daffodils and blooming trees like cherry blossom and magnolias. It is always funny to see that while one person cycled in a short-sleeved T-shirt, others were still wearing their winter coats and scarves. Coats that some others again had draped over their handle bars. Here’s a short video of that first day of spring. The video is a lot shorter than what you are used to and that has a reason. After a couple of hours of filming my camera suddenly reported a ‘disk error’ and to make a long story short: all the footage became unreachable. I’ve had experts look at it, and I even bought a recovery program, but it is not salvageable. Luckily… I had another SD card and although I expected the footage to be readable at home, I did shoot some extra shots. So that is now all the footage that was left of an entire afternoon of filming. It’s what will have to do for this week… because of course, the first day of spring only lasts one day! (And the weather wasn’t quite that good in the following days to film again.) I hope you still like it! This entry was posted on 27 March 2014 by Bicycle Dutch in Original posts and tagged Spring, Utrecht, watching people cycling.